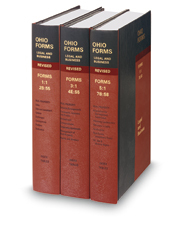 Ohio Forms: Legal and Business contains hundreds of predrafted forms, each with a companion explanation of relevant law. Ohio-specific forms cover every contingency, including real property, lease and consumer protection, contracts, personal property and business enterprises, assignments, estate planning, family law, nonprofit organizations, and the Uniform Commercial Code. Each chapter includes an overview, section descriptions, forms, tables, index, and cross-references to noteworthy articles. Research aids direct you to pertinent annotations, law reviews, and other legal sources.